There’s a lot of false information out there when talking about anxiety. In my counseling practice in Tampa, I deal with anxiety issues on a daily basis. So I’ve pretty much heard most of the anxiety myths out there. Here I’ll break down 4 Myths About Anxiety and bust them with the truth…. 1.) Anxiety comes out of nowhere. Wrongo! Although it feels like anxiety sneaks up out of nowhere, it doesn’t start off that way. There is always an origin to anxiety. Anxiety comes from worrying about something potentially happening or something did happen that you couldn’t stop or change. To address these worrisome thoughts, you also have to find its origin – which could come from an variety of things. These thoughts could be from your thoughts about yourself, the people around you, how you performer at work, your role as a parent…. The list goes on. Everyone’s anxiety is unique to them. So is yours! 2.) There’s no cure for anxiety. Let’s bust myth #2 shall we? Looking at the research over the past decade, there has been shown clear techniques and interventions that directly decrease levels of anxiety. In my counseling practice in Tampa we use these practices. Click HERE to learn more. Wishing your anxiety would go away is not a strategy. Working with someone who has a plan is. Pick a strategy that works. 3.) There’s a magic pill that takes my anxiety away. Busted! Anxiety is a thought disorder. This means… your thoughts are creating the reoccurring surges of anxiety throughout your mind and body. Which is now on a feedback loop. Is there a magic pill that changes your thoughts?? I don’t think so. 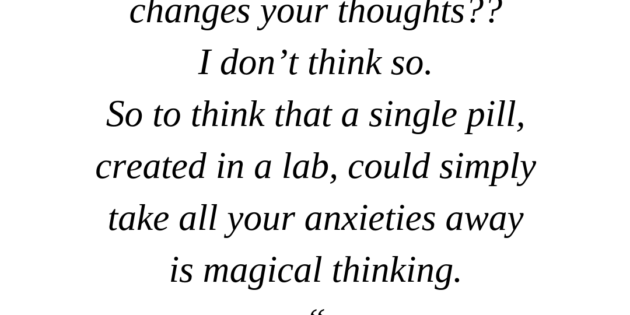 So to think that a single pill created in a lab could simply make all your anxiety go away is magical thinking. 4.) I’m weak if I ask for help. This couldn’t be furthest from the truth. The strongest people I know are the quickest ones to ask for help. It takes courage and strength to ask for help. You’re not expected to do it alone. Find someone that specialize in anxiety and find a shortcut for yourself. You don’t have to keep torturing yourself because you should just “handle it” and ignore it. This is will never allow you to overcome your anxiety. Take weeks, months, or even years off your anxiety journey and find a plan that works. Aniesa Hanson is a licensed Tampa therapist and the owner of Aniesa Hanson Counseling. She’s dedicated her life to helping people overcome struggles with anxiety, relationship issues, and personal growth. If you’re interested in working with, or want to ask a question, click here. We look forward to working with you in the future!